Why are you using Quadro cards for tests and benchmark examples? They are mostly useless for rendering as they have very few Cuda cores. You should develop, test and benchmark on Gforce and Tesla cards exclusively. Just mentioning and using Quadro card in a GPU acceleration context suggests you are unaware of which is the correct hardware to use for the task. The Quadro K5000 is a certified GPU for both 3ds Max and Maya 2015 and a card often included in professional workstations. We do preform benchmarks and testing on various NVIDIA GPUs but for this post we chose the K5000. You are correct, the higher CUDA core count the better the card preforms for CUDA based raytracing operations. GPUs accellerate the rendering but we don’t rely on them. You can still run the new GI engine prototype on your renderfarm using the CPU mode. *is this absolute limit of 25mil triangles temporary and for prototyping reasons, or rather it is a limit imposed by the architecture of the new engine itself? This is temporary. Removing the limit just didn’t make it into this version of the prototype. Using Centos 6.5 and Maya 2015 SP 2. I could not found any library like that in my packet management. On Linux, you have to add the mentalray bin directory to the LD_LIBRARY_PATH, e.g.’setenv LD_LIBRARY_PATH /usr/autodesk/mentalrayForMaya2015/bin:$LD_LIBRARY_PATH’. On MacOS, it’s the DYLD_LIBRARY_PATH that needs to be defined, e.g. ’setenv DYLD_LIBRARY_PATH /Applications/Autodesk/mentalrayForMaya2015/bin’ prior to starting Maya2015. Sorry for the inconvenience! This is great to see! Is the intention to eventually use the GPU for more than just GI calculations? I envisage using mr in the future, and the GPU assisting the CPU with more than just the GI part of the render. Hi developers!…. I was the only betatester of Nvidia Gelato in Spain back in 2005 if I recall properly and I hope we will get a better approach this time with this new render engine. I’m installing the prototype right now and I hope to be of any help with the betatesting. This should speed things up considerably! I’ve tried this script on Maya 2015 SP2 on a Windows 8.1 machine. It has a nVidia GeForce GTX 750Ti with 2 Gb VRAM and once I enable the GI on the GPU and hit render, it crashes Maya on a very simple scene. I’m wondering if it is because of the GPU being based on the new Maxwell architecture? Maxwell is supported. Do you have a recent driver installed? Just a FYI, my problem is now resolved. I installed SP3 but I also noticed that there’s a seperate update for mental ray to SP3. SP2 had the same thing but not SP1 so I suspect I might have not updated mental ray to SP2 while Maya was SP2. Hi! I am unable to achieve depth of field in my renderings when using this GPU GI prototype. Is there something I need to change/enable or is it just something that was overlooked in the prototype? Depth of field is not yet supported by the prototype. Sorry for that! what is this error ? ( DB 0.4 193 MB error 041012: attempt to unpin null tag ) and how I can remove it? What string options I can put, to remove the warning? Marcello, We are investigating the unpin issue, thanks for reporting. 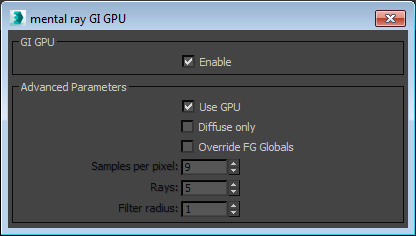 Irradiance particles cannot be used with GI GPU, to remove the warning please disable irradiance particles. yes I know that not work with irradiance P. but is strange becasue I not insert the IP in my original scene. the warnig is present when use the script or string option and activate the GI GPU. why the irradiance particle is present if If activate the script GI GPU ? is possible to turn off the irradiance Ip with a new string option ? for disable the IP with the gi gpu. Marcello, We are unable to reproduce this. 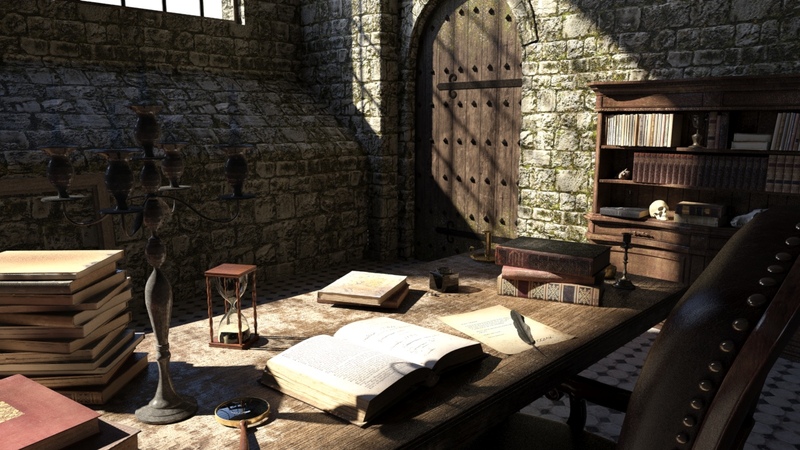 Please visit the mental ray forum and create a topic in the GI GPU section with your scene and setting details. Link here. GI on the GPU would be an excellent and fast look development tool on local workstations. Eventually upgrading the render farm would be useful to have similar render times. The results between CPU and GPU are identical. Once it is out of the prototype phase you can make complete use of it locally for artists and begin populating the render farm over time. In my tests, the prototype performs well compared to other rendering solutions on the CPU so it’s still good for CPU fallback on a farm. So, will this acceleration work with IBL? Hi Daniel, yes, IBL is part of the supported feature set! I wonder if/how CPU could be used for accelerating ray traced reflections and specifically blurry reflections? And then freezes up and crashes. Any thoughts to resolve this? Which GPU driver version are you using? Please download the latest version from http://www.nvidia.com/drivers. Hi, i’m not new to Maya but Iam new to using Mel Script. I have tried to apply this Mel Script to my Maya Mel Editor, then applied it to my custome shelf. But can not seem to get it to work could someone post a tutorial or a walkthough just so i know i doing it right. Sorry about this it has decided to work after all. Hi there is there any chance this script will be available for revit 2016? Does it work with 3d max 2014? Hi – any chance this may be available on Max 2014? No, we cannot backport this to older versions of Max. Please note that 3ds max 2017 includes the latest GI with GPU acceleration in the UI. No script needed. Depth-of-field, motion blur, everything should be supported. How to run this script in Maya 2015? You can download the script and copy it into your personal script folder (eg Documents/maya/2015/scripts). Then, after starting Maya, you can call GI_GPU() from the script editor. 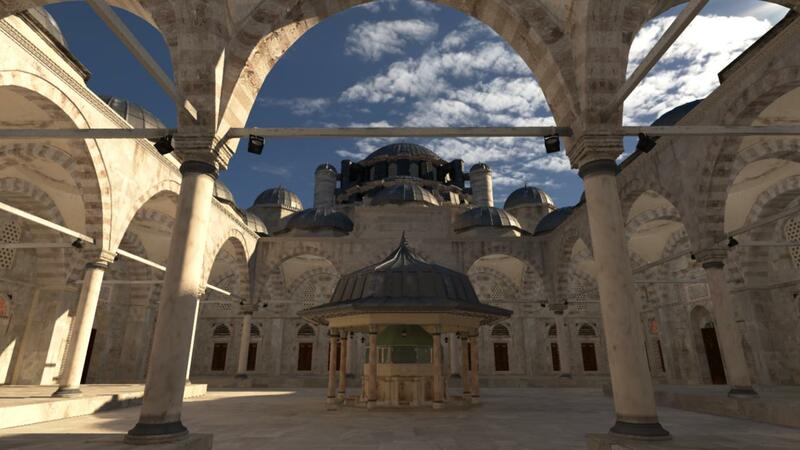 Hi, can you please contact us on the NVIDIA Advanced Rendering Forum and explain your problem in more detail? Hi, is this ok to use on 3ds max 2017 with mental ray, hoping to use cpu and gpu to cut render times ? No, in 3ds Max 2017 you should be using GI Next, which is directly incorporated into the UI under Global Illumination tab of Render Setup, above Final Gathering.